The Hotel Margareth , 3 stars in Riccione, offers services for families with children, rooms equipped for the disabled, 24-hour bar and parking on request. Pets are allowed. 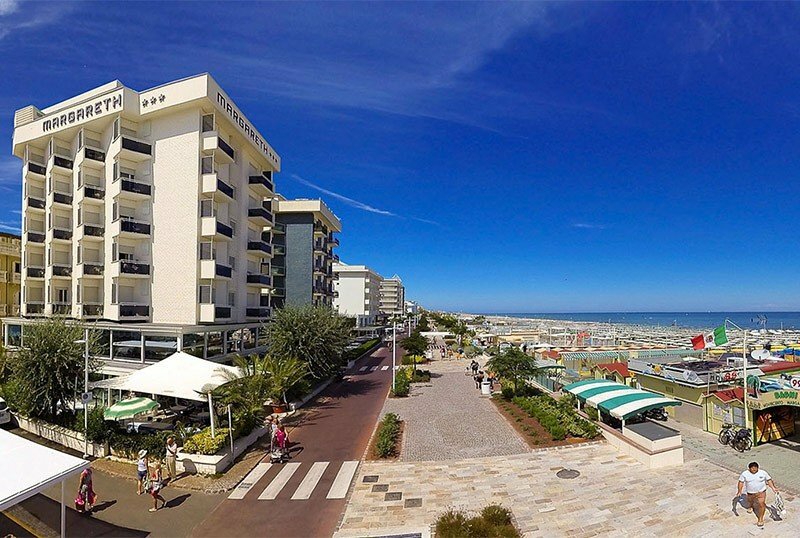 The hotel is located on the seafront of Riccione, in front of the beach. Viale Ceccarini is about 15 minutes on foot. All rooms have a balcony with sea view, air conditioning, minibar, satellite TV, WI-FI, telephone, private bathroom with hairdryer, shower and complimentary toiletries. Single, double and disabled rooms are available. The rooms differ in the type of treatment chosen. STANDARD : with all the services listed above. COMFORT : in addition to the standard services, it includes beach service, drinks with meals and drinks in the minibar. SUPERIOR : in addition to the comfort services, fruit basket and newspaper of your choice every morning, unlimited drinks 24 hours a day, reserved parking space and safe. FAMILIES : multi-bed rooms available on request. Large open-air porch facing the sea, panoramic sun terrace, bicycles available, hall with reading room and American bar 24 hours a day, reading room, conference room (50 seats), elevator, free laundry service, free shuttle to Rimini airport and train station. On request, the hotel organizes refreshments, aperitifs and theme nights with live music. PARKING : covered and uncovered parking space on request or garage (all solutions are subject to charge). CONVENTIONS : beach, amusement parks, gymnasium, discotheques, amusement parks, waterslide, INAIL / INPS, law enforcement, shuttle service to Rimini airport and train station, organized excursions on request. SERVICES FOR DISABLED : entrance on the ground floor, lift for disabled people, rooms with wheelchair maneuvering space, bathroom with accessible shower and special chair. The beah affiliated with the hotel also has dedicated services. PETS : allowed of all sizes, upon notice at the time of booking you can have equipped rooms, bowls and accessories. The beah affiliated with the hotel is pet friendly. BREAKFAST : international buffet breakfast with croissants, homemade desserts, cereals, yoghurt, cold cuts, eggs, cheeses and fruit juices; espresso cafe with coffee, cappuccinos, chocolates and hot drinks. LUNCH AND DINNER : 3 or more choice menu with homemade pasta and desserts, meat and fish dishes. Rich wine list. VARIATIONS : upon request the kitchen prepares vegan, vegetarian and celiac menus. In hotel : indoor and outdoor playground area, strollers, bicycles with child seats, entertainment, baby / mini / junior club. Baby sitter and pediatric counseling are available upon request. In the room : cot or cot, baby bath, changing table, bottle warmer, clothes rack, nappy holder and night light. At meals : flexible hours, dedicated menus, afternoon snack, baby cutlery, kitchenette available with pastries, brodini, parmesan cheese, extra virgin olive oil, boiled vegetables. The hotel has an agreement with the beaches of Bagno n. 97 The women's beach, Bagno n. 98 Carla, Bathroom n. 99 Rina and Bagno n. 100. Guests have access to many services including mini club and live entertainment, sports fields, beach tennis, volleyball, bowling, fitness area, trampoline, entertainment for adults and children. Prices are per day per adult person in full board for at least 3 days. - A credit card is required for each booking. It is used as a guarantee, no charges are made except in case of non-cancellation. After a long winter, the long Easter weekend is an excellent opportunity to spend a few days at the Hotel Margareth in Riccione directly on the sea. We are waiting for you to start the next summer in the best way !! !